Our Pulse Technology & Desulphation Process are Self-owned patents technology of Smart Resonant Pulse and No damaged to Plates when battery restored by our smart Pulse. That is a RELIABLE RECOVERY SYSTEM and Trusted Product of 60V eTricycle Intelligent Maintainer. The most widely and consistently application in industries & military installations makes Voltatech`s iM PULSE System the ideal choice. Its unique smart pulse technology and rugged design is perfectly suited to withstand heavy duty of helping corporations and consumers all over the world recycling & cost-down of batteries. 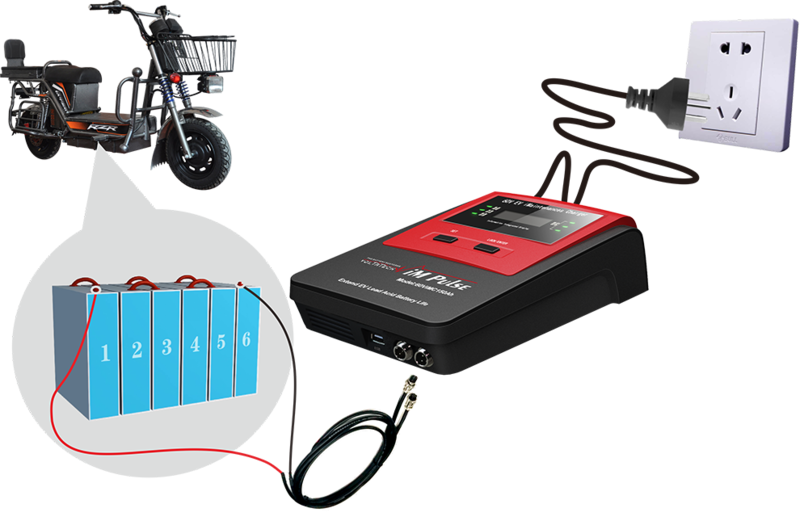 As you will read, this 60V ET150AH -- 60V Power Battery Maintenance Charger for electric bicycle or tricycle is a multi-functional charging maintenance system developed by us based on our multi-year research results used for power battery of electric vehicles. It is applicable to digital pulse charging, non-destructive repair and pulse maintenance desulfation of all types of lead batteries in 48V/10Ah~150Ah or 60V/10Ah~150Ah. As integrated the above battery care function with smart pulse of adjustable wave width, it is also called as 60V eTricycle Smart Charger or 60V eTricycle iCharger of Electric Tricycle Battery Repair Tools. Looking for ideal 60V ETricycle ICharger Manufacturer & supplier ? We have a wide selection at great prices to help you get creative. All the 60V ETricycle Smart Charger are quality guaranteed. We are China Origin Factory of 60V Power Battery Maintenance Charger. If you have any question, please feel free to contact us.